I wonder what the occasion was for my Uncle Chuck to be dressed in a tuxedo with a slim bow tie. Graduation? Prom? Standing in the lawn of 607 Mansell Drive, the family home with my great grandmother Margaret Pepperney Lowry. Assuming this was later in high school for Chuck, it puts this photo around 1966. Charles Lowry and Margaret Mary Pepperney Lowry (1902-1980), photograph, taken at 607 Mansell Drive, Youngstown, Ohio, around 1966; digital image, photocopy of original, scanned in 2013 by Joseph Lowry; privately held by Mary McCaffrey, [address for private use], Canton, Ohio; Young man in tuxedo standing next to older woman in frock coat; Provenance is Mary Pepperney Lowry to Charles Lowry to Mary McCaffrey. I’ve previously written about my great grand uncle Edward Lowry, wondering what happened to him after 1904 and what he did in the last few years of his life. In the 14 months since I wrote that piece, I’ve discovered quite a bit. At the turn of the 20th century, Edward was living in Republic, Ferry County, Washington. 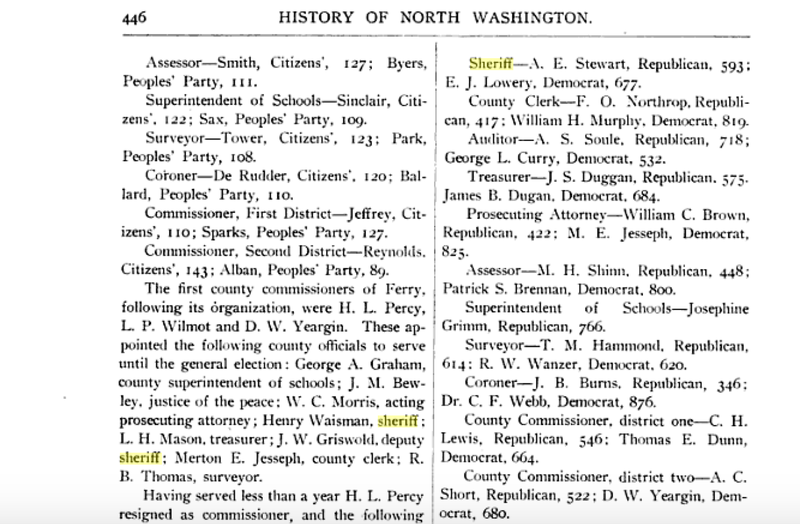 He went to Washington to seek work and perhaps a fortune as a miner, but by 1900, he was was the Democratic candidate for sheriff of Ferry County in what was the first election since the county separated from Stevens County. No doubt utilizing the same skills of politicking that he used as a labor organizer in Colorado, he won the 1900 election for sheriff by a count of 677 to 593, beating Republican A.E. Stewart. Lowry took the role well, as various newspaper accounts from the early 1900’s depict him chasing after escaped inmates, seizing sheep due to a failure to pay taxes, rounding up murderers and investigating robberies, as was the case in October 1901 as reported by the Spokane Spokesman-Review. As it turns out, Republic resident and rancher Frank O’Brien’s wife was keen on leaving the family fortune in the hen house instead of the bank. While employee Michael Smith was cleaning out the chicken coop, he discovered the O’Brien fortune and pocketed it, setting off by hired carriage and then train. Sheriff Lowry took the complaint and directed that a wire report be sent before setting off in search his fugitive. That wire report made the difference as a train was stopped by Canadian lawmen in British Columbia with Smith aboard. With some of the gold still in his possession upon arrest, Smith was brought back to the Republic jail to face his accusers. Just two and a half months later, Sheriff Lowry had the dubious distinction of losing several of his inmates who escaped by sawing through the wooden jail bars. The Spokesman-Review and San Francisco Call both depict the tale of how Lowry recaptured the fugitives. Not realizing they were gone for several hours after the escape, he was quick to pick up their trail. He located two in the town of Wauconda, 16 miles to the west, while two more were reported to be in Curlew 20 miles to the north. It was the two in Curlew who were up to no good, committing their second felony of the day (the first being their escape from jail). When Lowry entered the saloon in which the two men were reported to be, he found the barkeeper and patrons lined up along the rail being robbed! The warm Washington summer of 1903 saw Lowry climbing Gibraltar Mountain, just a few miles outside Republic. 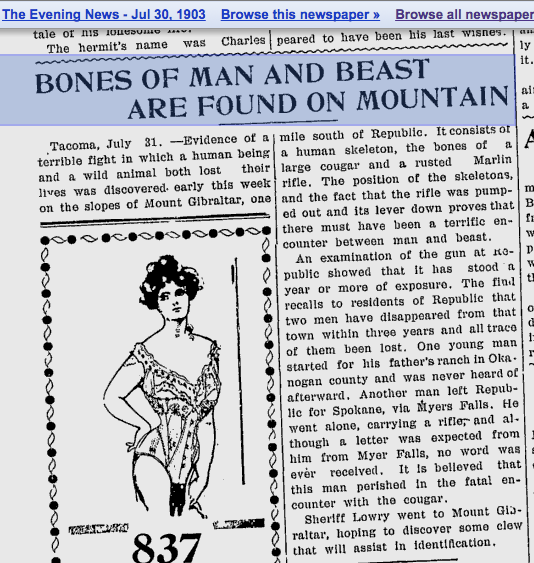 Someone had discovered a grisly scene, with the bones of a man and cougar lying near one another. From the evidence at the scene, it appears to have been a terrible struggle that occurred over a year prior. The gun was quite rusted and the remains very much decayed. Lowry’s role as sheriff was to identify the victim. The San Jose, California Evening News found the story so terrific that they carried it on their July 31 front page. 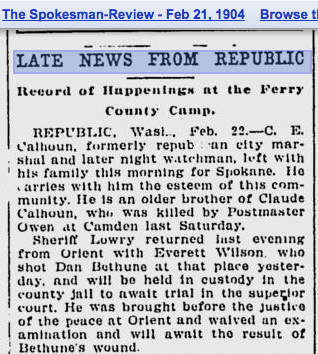 Lowry’s final appearance as a man of law and order in readily available newspapers is February 24, 1904. Again, he was doing what he had done several times before in bringing back a fugitive, Everett Wilson. Wilson shot a man named Dan Bethune, although for what cause we aren’t certain. Of interest to the reader, Wilson was to await the result of Bethune’s wound in jail. Translating the parlance and with the medical knowledge of 1904, Bethune was probably a dead man walking. Funeral of E. LAWRY [sic] – The funeral of E. Lawry will be held this afternoon at 4 o’clock at the undertaking parlors of Easterling & Whitney. Mr. Lawry came here last Sunday, very ill of consumption, and died Monday morning. His home was in Republic, Wash., where his wife and other relatives now are. A son sixteen years old accompanied him here. He was quite a prominent man in his county having served two years as sheriff. He was a member of the Fraternal Order of Eagles which society will have charge of his funeral. Lowry was 49 years old when he died. He’s buried in Phoenix. An Illustrated History of Stevens, Ferry, Okanogan and Chelan Counties, State of Washington, Volume 1, (Washington, Western Historical Publishing Company, 1904), 446; digital images, Google Books (http://books.Google.com : accessed 30 Nov 2015). “Cash Taken From Cache,” The Spokesman-Review, 10 Oct 1901, p. 1, col. 2; image copy. Google News (http://news.google.com/ : accessed 30 Nov 2015), Google News Archive. “Sawed To Liberty,” The Spokesman-Review, 29 Dec 1901, p. 1, col. 6; image copy. Google News (http://news.google.com/ : accessed 30 Nov 2015), Google News Archive. “Fugitive Prisoners Are Captured,” San Fransisco Call, 29 Dec 1901, p. 20, col. 5; image copy. University of California, Riverside (http://cdnc.ucr.edu/ : accessed 30 Nov 2015), California Digital Newspaper Collection. 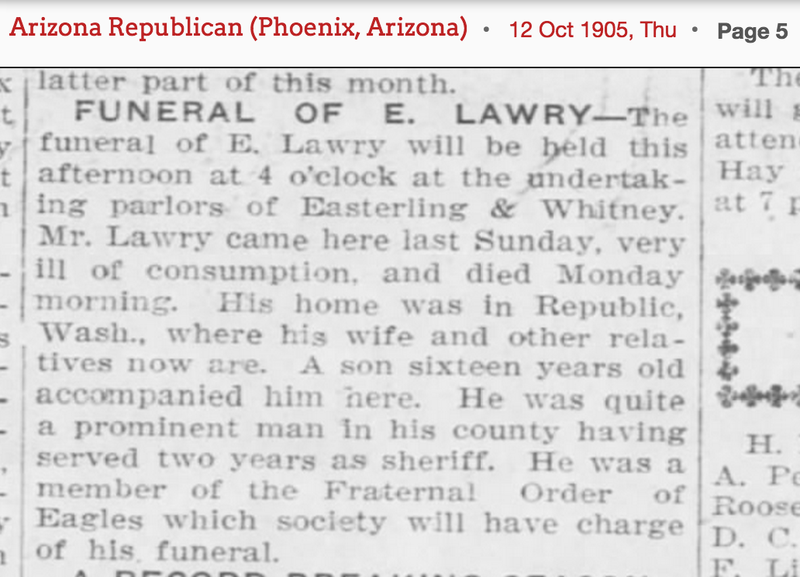 “Funeral for E. Lawry,” The Arizona Republican, 12 Oct 1905, p. 5, col. 3; image copy. Newspapers.com (www.newspapers.com : accessed 30 Nov 2015). 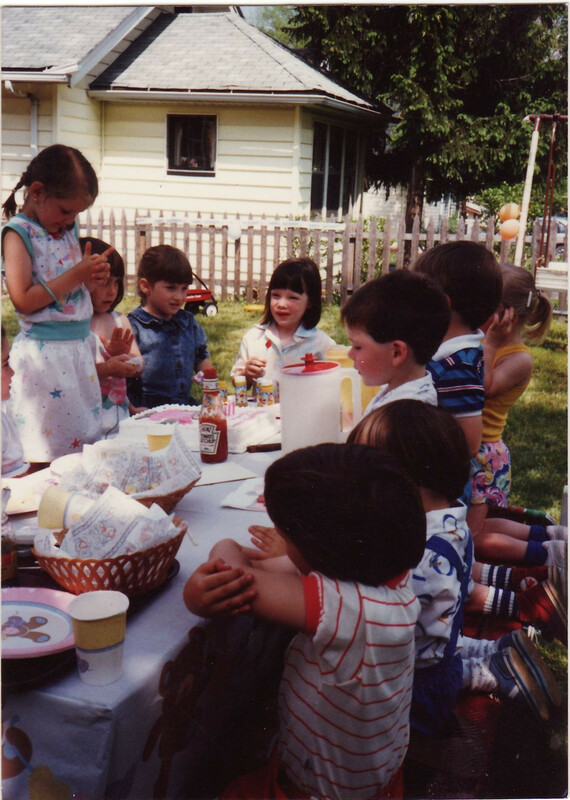 If I had to take a guess, I’d say this photo was taken in May 1987 for my sister Caroline’s fifth birthday. The location is the backyard of the first house we grew up at in Youngstown, 233 West Dennick. Mr. and Mrs. Booth’s yellow ranch is behind us. As you can see in the photo, we had a swing set and picnic table as well as a sandbox and garden. Dennick had a great backyard for little kids. The people I can identify in the picture include Caroline (standing on the bench), cousin Laura Lowry (center, at the end of the table), Joe Lowry (me! In the blue shirt and white collar), cousin Mike Lowry to my left and probably one or two of the Muir boys closet to the photographer. Caroline Lowry with friends and cousins, photograph, taken in the backyard of 233 W Dennick Ave in Youngstown, Ohio around 1987; image taken by unknown photographer; privately held by Patrick Lowry, [address for private use], Poland, Ohio. Caroline Lowry celebrating her fourth birthday with family and friends. My niece Amelia being held by her Uncle Joe. 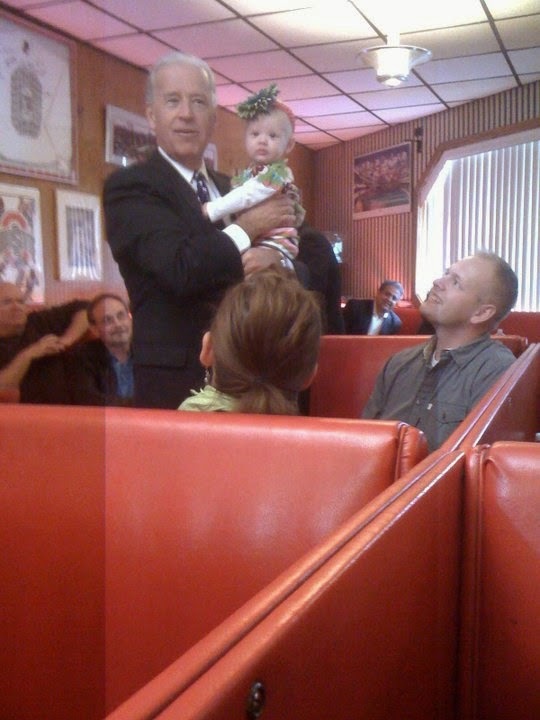 Joseph Biden, Amelia Nagy, Jon Nagy and Caroline Lowry-Nagy, photograph, taken at the Golden Dawn Restaurant in Youngstown, Ohio on 4 Oct 2010; digital image taken by Patrick Lowry; privately held by Patrick Lowry, [address for private use], Poland, Ohio. Vice President Joe Biden holding Amelia Nagy while parents Jon and Caroline Nagy look on.